Enjoy the luxury of a highly qualified and fully insured Nail Salon in Sedona AZ. We offer a wide range of packages and treatments or a simple pedicure or manicure. We’re proud to offer you quality nail care products in order to give you the best possible nail care service your money can buy. 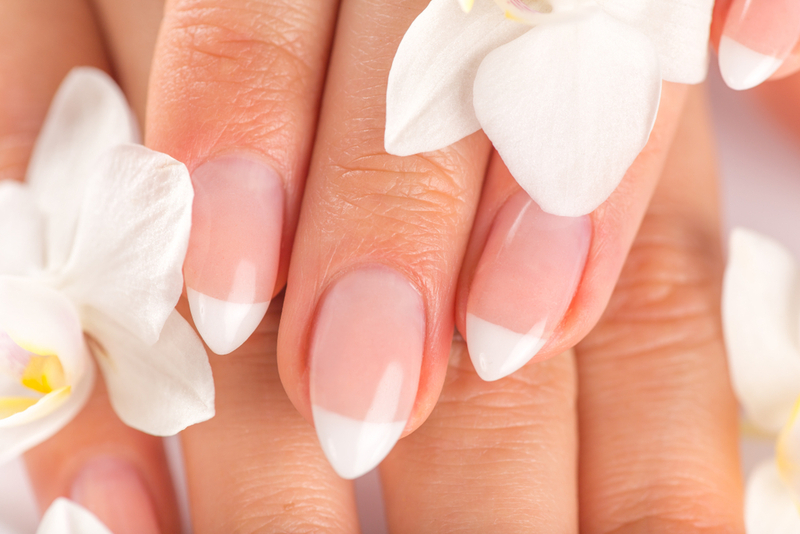 Our expert manicurists take the time to make sure that your nails get the love and care they need! Treat your hands to a on-the-go Express Manicure! Your nails are re-shaped and buffed and your cuticles are groomed, followed by a shea-butter lotion application to the hands and arms. This Express Manicure is finished with a beautiful Dazzle Dry Nail Lacquer application which is non-toxic, vegan, hypoallergenic, non-yellowing, quick drying, long-wearing, and a fortifying nail treatment. Spruce up your feet with a refreshing Express Pedicure! Includes aromatic soothing spearmint & eucalyptus foot soak, trim, file and shape nails followed by cuticle detail. Calluses are reduced, soothing massage is performed using a hydrating shea-butter cream on the legs and feet. The Express Pedicure is finished with a beautiful Dazzle Dry Nail Lacquer application which is non-toxic, vegan, hypoallergenic, non-yellowing, quick drying, long-wearing and a fortifying nail treatment. Come relax with us and pamper your hands to a Spa Manicure. Your hands are first bathed in a warm aromatic spearmint & eucalyptus soak and your nails are re-shaped, buffed, filed, and cuticles groomed. Next, enjoy a relaxing hand and arm massage with a deep penetrating shea-butter cream that locks in moisture instantly! This Spa Manicure is finished with a beautiful Dazzle Dry Nail Lacquer application which is non-toxic, vegan, hypoallergenic, non-yellowing, quick drying, long-wearing, and a fortifying nail treatment. Relax and balance from the soles up as your feet and lower legs are soothed and stimulated with this Spa Pedicure. Includes aromatic spearmint & eucalyptus foot soak followed with a re-shaping, filing, buffing, and cuticle grooming. Calluses are reduced, feet and legs are gently exfoliated using fruit acids that brighten the skin and slough away dead skin. Next, enjoy a relaxing massage for your feet and legs with an ultra-hydrating shea-butter cream that will leave your skin soft and hydrated. This Spa Pedicure if finished with a beautiful Dazzle Dry Nail Lacquer application which is non-toxic, vegan, hypoallergenic, non-yellowing, quick drying, long-wearing, and a fortifying nail treatment. Awaken your senses and relax into ultimate bliss with a Deluxe Spa Manicure! This luxurious Manicure begins with a hand soak in a spearmint & eucalyptus bath followed with a re-shaping, filing, buffing and cuticle grooming. Next, we soothe and soften the hands with our eco-friendly alternative to tradition paraffin which contains a blend of palm, jojoba, soy, vitamin E, shea-butter, organic oils and essential oils. The hands are then placed in warm mittens, leaving your skin silky soft and supple. 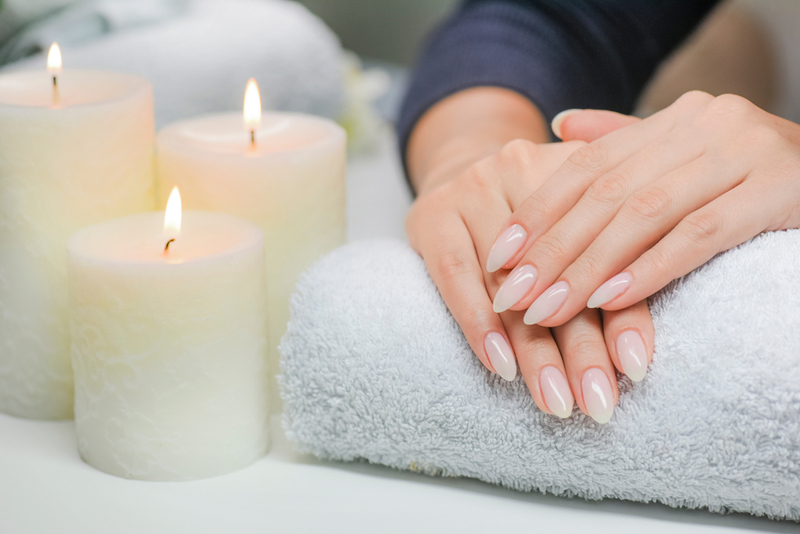 Sit back and relax with an ultimate massage for the arms and hands in this Deluxe Spa Manicure. This manicure is finished with a beautiful Dazzle Dry Nail Lacquer application which is non-toxic, vegan, hypoallergenic, non-yellowing, quick drying, long-wearing, and a fortifying nail treatment. 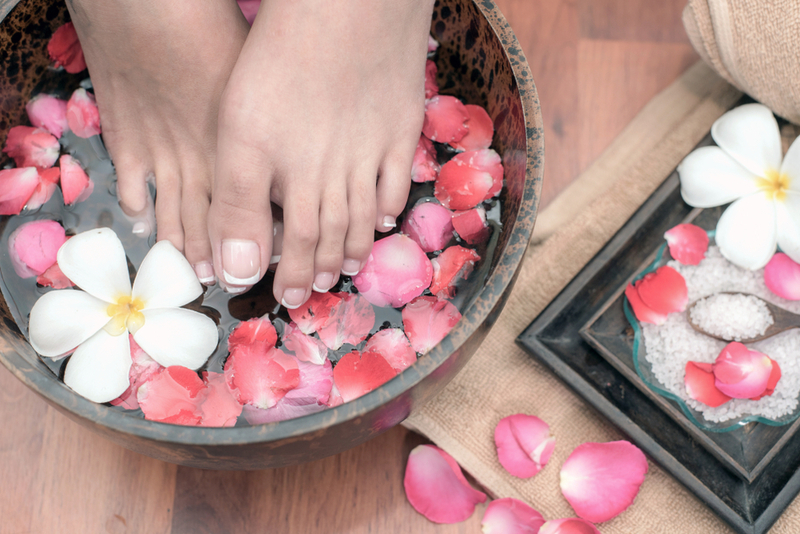 Awaken your senses and relax into ultimate bliss with a Deluxe Spa Pedicure! This luxurious Pedicure begins with a spearmint & eucalyptus foot soak followed with a re-shaping, filing, buffing and cuticle grooming. Calluses are reduced, feet and legs are gently exfoliated using fruit acids that brighten the skin and slough away dead skin. Next, we soothe and soften the feet with our eco-friendly alternative to tradition paraffin which contains a blend of palm, jojoba, soy, vitamin E, shea-butter, organic oils and essential oils. The feet are then placed in warm mittens, leaving your skin silky soft and supple. Sit back and relax with an ultimate massage for the legs and feet in this Deluxe Spa Pedicure. This pedicure is finished with a beautiful Dazzle Dry Nail Lacquer application which is non-toxic, vegan, hypoallergenic, non-yellowing, quick drying, long-wearing, and a fortifying nail treatment. Treat your feet to something sweet! Our Honey Dream Pedicure features Manuka, a rare variety of honey harvested only in New Zealand and is known for its restorative and antibacterial properties. The Honey foot soak is drizzled into a warm foot bath, and then your nails are then filed, shaped, buffed and the cuticles groomed. Calluses are reduced, feet and legs are gently exfoliated using fruit acids that brighten the skin and slough away dead skin. Next enjoy a relaxing massage to the feet and legs with a moisturizing shea-butter cream. This Honey Dream Pedicure will be finished with a beautiful Dazzle Dry Nail Lacquer application which is non-toxic, vegan, hypoallergenic, non-yellowing, quick drying, long-wearing, and a fortifying nail treatment. With a unique blend of extracts, and pure essential oils, this pedicure will leave your skin feeling smooth and smelling sweet! Pamper your feet with a soothing hot stone pedicure and feel yourself melt away! Relieve aches and pains in those tired feet and legs. This Hot Stone Pedicure starts with a spearmint & eucalyptus foot soak followed with a re-shaping, filing, buffing and cuticle grooming. Calluses are reduced, feet and legs are gently exfoliated using fruit acids that brighten the skin and slough away dead skin. Next enjoy a relaxing massage to the feet and legs with a hydrating shea-butter and then hot stones will then be massaged to relieve aches and pains. This Hot Stone Pedicure will be finished with a beautiful Dazzle Dry Nail Lacquer application which is non-toxic, vegan, hypoallergenic, non-yellowing, quick drying, long-wearing, and a fortifying nail treatment. Come Relax and detoxify with our Himalayan Salt Pedicure. Enjoy a mineral-rich Himalayan Foot soak which promotes natural detoxification and our soothing Himalayan Salt foot roller massaged onto the legs and feet that balances the body’s central nervous system, electromagnetic field, and meridians. This Himalayan Salt Pedicure includes reshaping, filing, buffing, and cuticle grooming and will be finished with a beautiful Dazzle Dry Nail Lacquer application which is non-toxic, vegan, hypoallergenic, non-yellowing, quick drying, long-wearing, and a fortifying nail treatment.